The TrackingPoint AR Smart Rifle is powerful and deadly--even in the "wrong" hands. Geared toward sport hunters, this Precision Guided Firearm is a closed-loop system, not just a high-tech scope. 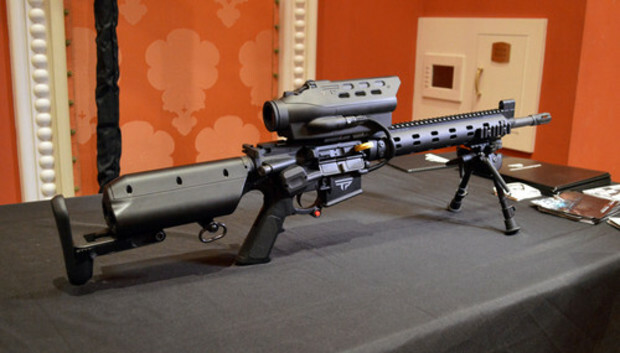 The system includes a custom rifle manufactured by Surgeon, a Networked Tracking Scope by TrackingPoint, and a guided trigger, all of which work in tandem to ensure a more accurate shot from as much as 500 yards away. Basically, this rifle helps less-experienced hunters become skilled marksmen in a second, all thanks to technology. Here's how it works: The TrackingPoint AR Smart Rifle features TrackingPoint's Tag Track Xact system, which lets hunters tag multiple targets from far away. Once a target has been tagged through the TTX system, all the hunter has to do is pull the trigger--the system does the rest. It lines up the shot, electronically controls for external variables, and only then does it actual fire the shot, once everything is in place. The system has an automatic ballistic calculator, which tracks the following variables: range, drop, magnus effect, spin drift, coriolis effect, cant, inclination, pressure, temperature, relative humidity, adaptive lifecycle ballistics, muzzle velocity, ballistic coefficient, barrel length and twist, lock time, and drag coefficient. It can also control for wind speed and direction when lining up the shot, but you'll have to input that manually. According to TrackingPoint, all of this significantly increases your first shot success probability, helping you hit your mark quickly. In other words, even amateur shooters can successfully hit targets with the help of the TrackingPoint AR. The TrackingPoint Networked Tracking Scope also features a 14-megapixel video camera with a 110mm telephoto lens, so you can record and stream live video while hunting. Simply connect your rifle to the TrackingPoint app to stream live video at 54 frames per second, record shooting sequences, and take still photos of tags and shots. The video feature makes a nice memento of your trip, and can be used as a learning tool for new shooters. I'll just go ahead and say it: The TrackingPoint AR Smart Rifle sounds just a little daunting. But a TrackingPoint rep assures me that the company's target demographic--hunters, not snipers--can really use this technology. Imagine how this type of high-tech rifle can bring fathers and sons together, the rep says, because the father can use the video feedback to help his son improve his shooting skills. But that doesn't mean the company doesn't know what its technology can really do. The company is already in talks with the U.S. military, which has expressed an interest in TrackingPoint's technology. The TrackingPoint AR Smart Rifle will ship in October and cost approximately $10,000.